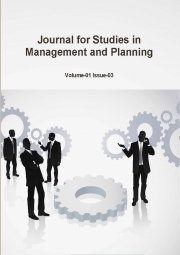 Description of "Journal for Studies in Management and Planning, April 2015 Part-1"
The aim of this journal is to propagate development in the different fields in management, planning, commerce, urban studies and development through research and its relevant appropriation and inferential application. We appreciate innovative and evolutionary research work differing from the bulk of monotonous content. We encourages publication of original research, empirical, conceptual and review papers. Reviews of "Journal for Studies in Management and Planning, April 2015 Part-1"